A fungal disease (Sclerotinia homeocarpa) that forms small brown spots on golf green grasses and other Bermuda turf grasses. It can be controlled with various cornmeal products. Tierra Verde Golf Club controlled it with corn gluten meal at fertilizer rates. It attacks most turfgrasses grown in the South. 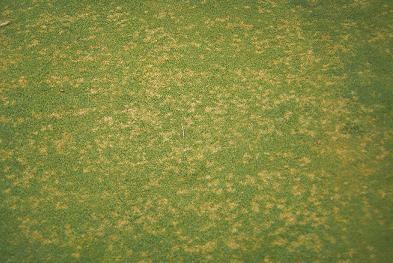 Bentgrass, hybrid Bermuda grasses and zoysia are most susceptible to this disease. It occurs from spring through fall, and is most active during moist periods of warm days (70-85°F) and cool nights (60°F) in the spring, early summer and fall. It is spread by water, mowers, other equipment and foot traffic. To prevent dollar spot, use proper cultural practices and the organic program to promote healthy turf. Avoid light frequent waterings. To cure dollar spot infection, apply a cornmeal or garlic in dry or liquid forms as needed. Applications are most critical during moist weather in the spring, early summer and fall when temperatures are between 70º and 80ºF.